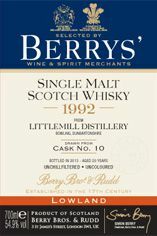 Littlemill distillery was founded at Bowling to the east of Glasgow on the banks of the river Clyde in the 1770s and laid claim to being Scotlands oldest distillery. It was dismantled in 1997 and the remaining buildings destroyed by a fire in 2004. The nose gives white chocolate and peach skins with traces of ginger, cinnamon and delicate peat. The palate comes alive with nectarines and more white chocolate as the mouth-feel fattens to release some honey and lemon. When excellent examples such as this appear they make Littlemills sad demise even sadder. Littlemill has the enviable claim of being quite possibly the oldest malt whisky distillery in Scotland. Or at least it would have had this, if it weren’t for the fact that production stopped permanently in 1996, and the remaining buildings were destroyed by fire in 2004. A Lowlands whisky distillery by classification, not only due to location but also due to its tradition of triple distillation, Littlemill bottlings are growing increasingly rare, so any aficionados should grab one as soon as they spot it.